I was lying down on dentist chair, with my dentist busy drilling out a cavity. She tells me, “I think I did all I can but tomorrow if you feel pain of any kind then it is root canal”. To this she replied, “50/50”. With a kind expression that only dentists have she replied, “It doesn’t matter about all others. Tomorrow when you eat ice cream you either have splitting pain or not. That is all matters. So it is 50/50 for you”. The mere fact that either I will be in pain or not (2 states) was her reasoning for 50/50. She is my dentist and I am not going to speak against here. 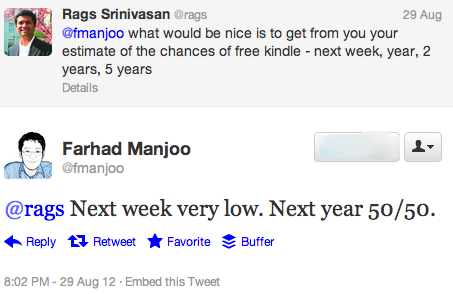 But I am going to point you the prediction by a reporter on how likely will Amazon introduce free Kindle. His answer, as you see above, is 50/50. The fact that there are only two outcomes does not mean they are equally probable. Take for instance lottery ticket, the fact that you will either wake up as lottery winner or not does not mean your chances of winning is 50/50. 50/50? That is not odds at all. That is just someone making things up when they don’t know and/or don’t know how one assign probabilities to future events. So in Kindle case whether or not we see free Kindle a 50/50 prediction covers both cases. The reporter can always say, “I told you so”. Such a prediction is not actionable and does not constitute probabilistic thinking. So how would make probabilistic predictions? Let me take you back to the dentist case. Suppose she has seen 1000s of people with condition close to mine and knows the outcome after she filled their cavity. Or she has access to a database of similar cases documented by many other dentists. Then based on the outcomes (prior knowledge) she could say, “of the 1000 people who has such a cavity filled 503 of them did not need root canal, so your chances are 50/50”. What does it mean in the case of making business predictions like predicting Free Kindle? Let me take you back to the Pinterest article I wrote and the companion article. Imagine enumerating all possible future scenarios of Amazon’s device strategy and computing the outcome. These scenarios are the equivalent of many different futures based on numerous variables like cost of production, demand, market forces, amazon’s other opportunities etc. Then we simply need to look at in what percentage of the scenarios does a free Kindle deliver more profit to Amazon than charging for it. Only after such an analysis can we say anything about the chances of a Free Kindle. Since no one has done such a scenario analysis, to say “50/50 chance of Free Kindle next year”, is simply pointless. And by the way, next time you hear 50/50 it is perfectly okay to assume the speaker has no clue because in 99.9999% of the cases no one has done the scenario analysis to make such probabilistic prediction and if they have they likely will not use an expression like 50/50.